Florentino Perez‘s admission that he would try to sign both Kylian Mbappe and Neymar this summer was very much tongue in cheek, yet the Brazilian is once again allowing rumours linking him to Real Madrid to swirl. This is not a new development either, as the former Santos prodigy allowed himself to be constantly linked with a return to LaLiga Santander with Los Blancos throughout his first campaign with the Parisian club. Neymar‘s entourage, predominantly his father, has intimated to those in power atReal Madrid that the forward plans to change his team in the summer of 2019. However, the player himself simply refuses to refute these rumours, but never quite takes the bold step of telling Nasser Al-Khelaifi he wishes to leave the Parc des Princes. Barcelona are also privy to the same information, although few within the Catalan club believes it would be correct to try and bring Neymar back to the club. Lionel Messi may well be in favour of a return, however Josep Maria Bartomeuand his colleagues haven’t discussed the possibility at any point, believing that the player left because he wanted to. 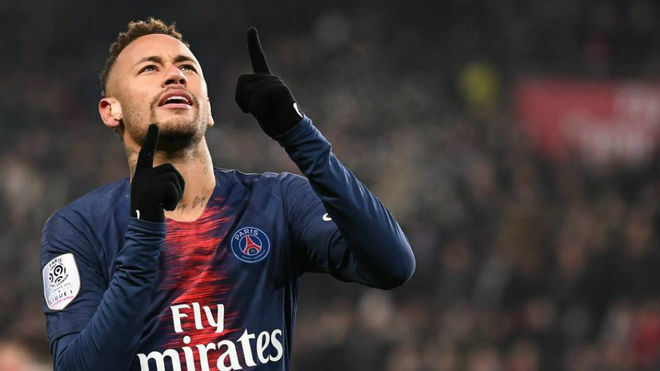 PSG‘s hierarchy are aware of the situation, and they are also aware of just how much the club’s Champions League exit at the hands of an injury-strickenManchester United hurt Neymar. In order to counteract this, the club plans to offer the Brazilian international a pay rise, whilst not extending the length of his original commitment to the French champions. Neymar has, in the last few months, become the official face of the National Bank of Qatar, a sponsorship which is believed to notably increase his overall annual income. Real Madrid will not rush, they will monitor the situation and are keen for the club not to be dragged into the rumour mill as they were in the summer of 2018. Los Blancos were forced to release an official statement, distancing themselves for any rumours linking them with a move for Neymar, and their feeling this summer is that if he really wants to join the club, he should be the one to make it public and do everything to make it happen. PSG and Real Madrid have a strong working relationship, and Florentino Perezwill simply refuse to make any attempt to sign Neymar without first consulting Al-Khelaifi. The picture will become clearer as the summer draws nearer, yet it would appear that the 224 million euros paid for him in addition to the pride of Qatar and thePSG project could make a move incredible difficult once again.